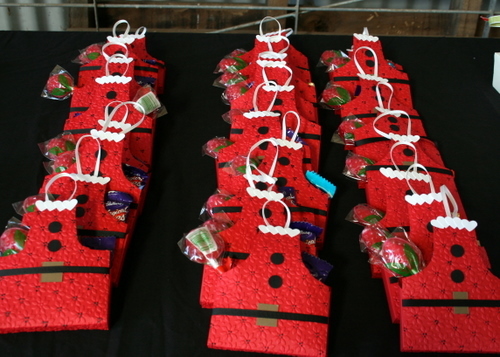 These are the little gifts I made for my Whakatane Extravaganza ladies yesterday. Its a CASE of Patti Lees Mrs Claus treat box she did recently..which I just adored and had to case! I used petals a plenty embossing folder and coloured in the berries with a marker. The trim I used is just the small heart punch.I ran outta time to finish them off but was pleased with the result nonetheless. Not a good shot but as I said I ran outta time!